Tungsten trioxide catalyst such as hydrogen desulfurization catalyst, SCR denitration catalyst, photocatalyst are widely used in different area. Tungsten trioxide(WO3) is a kind of important semiconductor material, it has catalytic property. 1. In tungsten trioxide hydrogen desulfurization catalyst, WO3 is the main active ingredient which plays the role of sulfur resisting characteristics. It has significant usage in cracked diesel oil and deep desulfurization of gasoline. 2.SCR desulfurization catalyst is the center of SCR(Selective Catalytic Reduction) system. 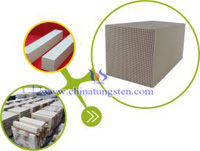 WO3 often takes about 10% content which can promote the thermal stability of carrier, avoid losing activity owing to calcination under high temperature. Besides that, the adding of WO3 improves the anti-sulfur and anti-alkali poisoning ability, thus the catalytic property will be better. 3.It has prospect application field in degrading organic pollutant and photocatalytic water splitting. To realize its property depends on its special structure and appearance. 4.In coulometric titration testing sulfur, it is used as catalyst to lower reaction activity and accelerate generating SO2 and suppress SO3 to promote precision rate of testing result. If you have any interest in tungsten trioxide, please feel free to contact us by email: sales@chinatungsten.com or by telephone: +86 592 5129696.